We offer an array of hire items for weddings, below you will find some of the most popular but if you need anything please get in touch and we will offer a quote. Your location will determine what we can supply to you. If a venue agrees, we can offer you Fire-pits (fire bowls, firepits, braziers) for hire supplied with kindling and fire-lighters, logs can also be supplied depending on your burn time. They are great for all age groups and invite conversation and laughter as everyone sits around and chews the fat of the day! They are perfect for all times of the year both Summer and Winter, they also make an excellent ash-tray if you have smokers amongst your group of friends. 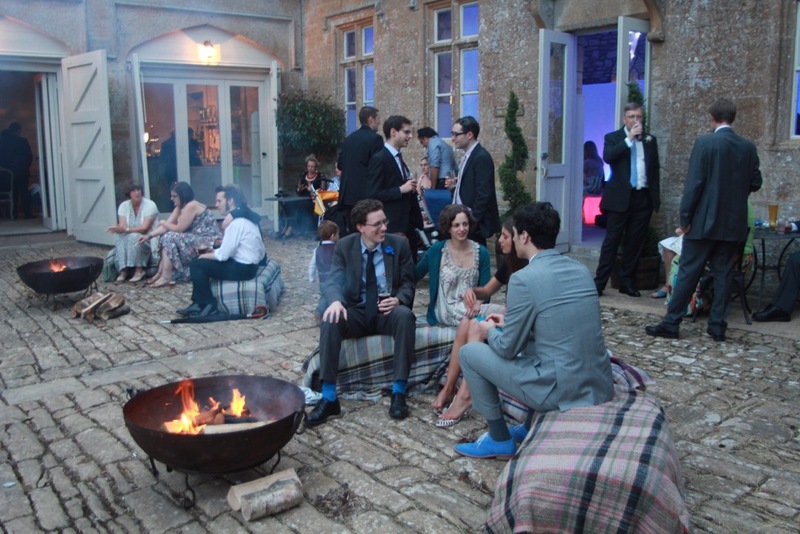 A large fire-pit supplied by STYLISH for weddings or parties. Deliver, Install and Collect - This involves us sending a man and van with fire-pits to your venue, we can also offer a crew member to light and attend the fire-pits across the evening at additional cost. Our fire-Pit kit includes:- 80 cm Fire-Pit, Low-Stand, Kindling and Fire-Lighters. We can also supply logs at additional costs which depends on the burn time. STYLISH are based in Somerset unless you are local to us the cost of delivery will be quite high. Change the colour and mood of your venue or marquee with low power, low-heat & very effective LED lighting. You can have the lights changing through 7 colours together or, choose one of the colours for the duration of your party. 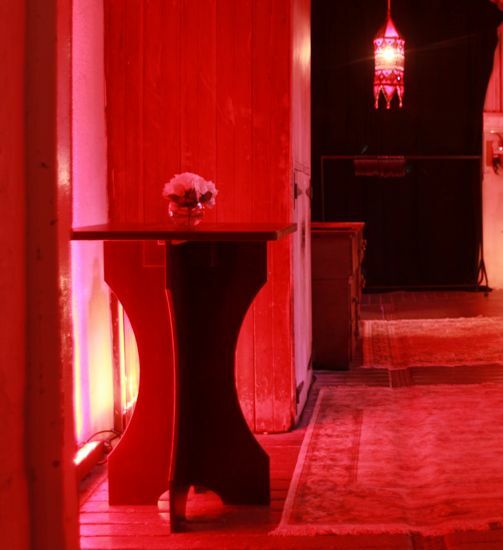 They are great in any venue and offer a contemporary party atmosphere and create a WoW factor. LED lighting can also be used to light exteriors including trees, foliage and helicopters! 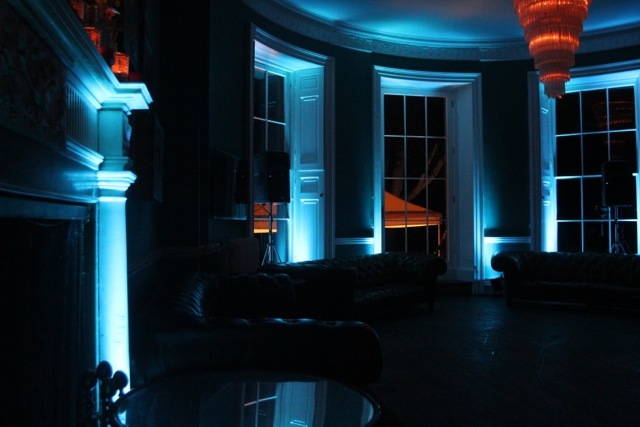 Nigel Peirce of STYLISH is a qualified lighting designer so will make any venue glow beautifully. 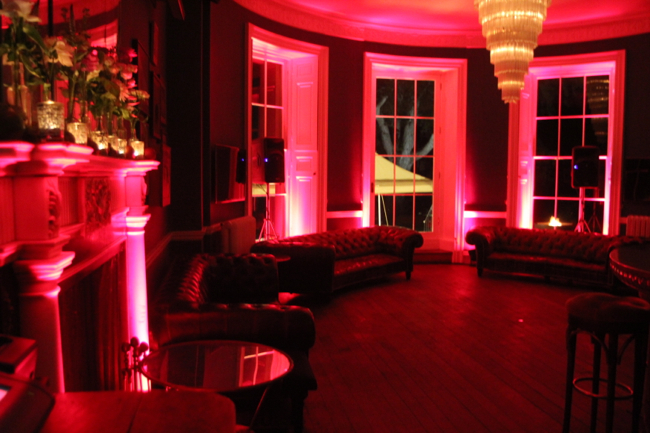 Transform any venue or room with LED up-lighting, this shows the Red option. Blue LED lighting transforming the beautiful bar at Babington House. We can supply your party a cocktail bar with bar staff to pour fantastic cocktails. We can supply the ingredients and advise you on cocktail combinations which enables quick delivery at the key time when your guests arrive. Our bar staff are all experienced mixologists and work at some of the best venues in the South West and have great personalities and are trust-worthy. Cocktail Time - The client wanted a MadMen party and we supplied a retro cocktail bar serving delicious cocktails. 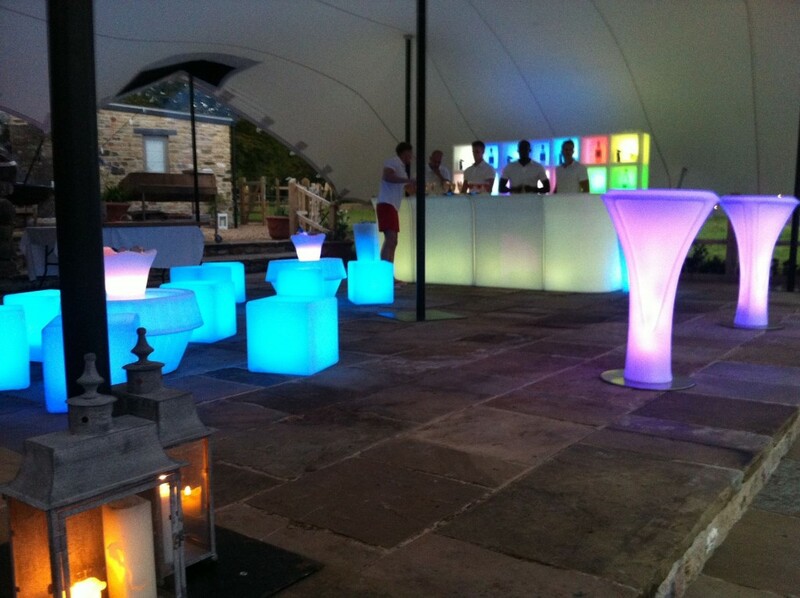 We supply LED furniture which is the latest in event furniture. Completely transform any venue and room. The furniture is controlled by remote control so you can keep it on one colour or fade through many colours from the Red, Green and Blue LEDs. Shown here are LED coffee table and chairs and also a large LED bar. 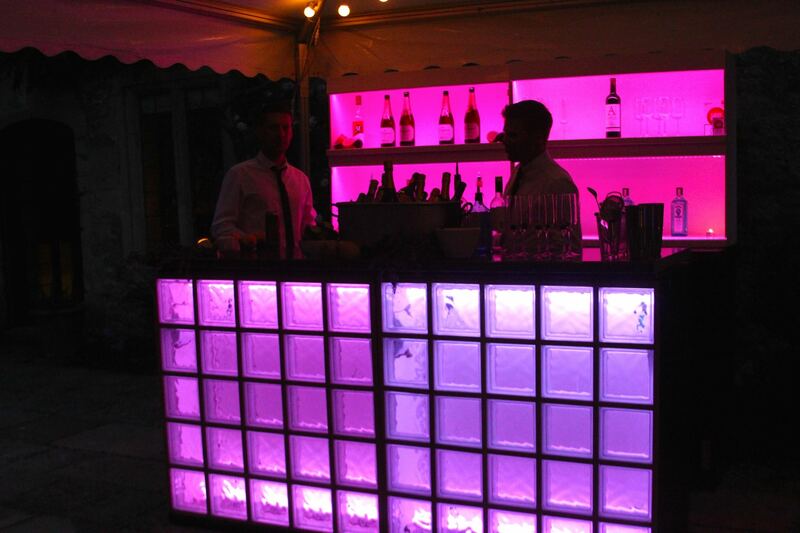 LED furniture adds a contemporary look to weddings and parties. You have a friend that is a DJ but they don't have any kit, we can supply everything you need for a great party, from a pair of Technics 1210s for vinyl to the latest in digital DJing. We also supply lighting which can be simple but effective or, you can opt for something more sophisticated with DMX control and a lighting engineer. We also supply full band equipment with a sound-engineer to operate and have supplied and worked with many artists including Boy George, Professor Green, The Overtones, Basement Jaxx, The Hoosiers and the Feeling. 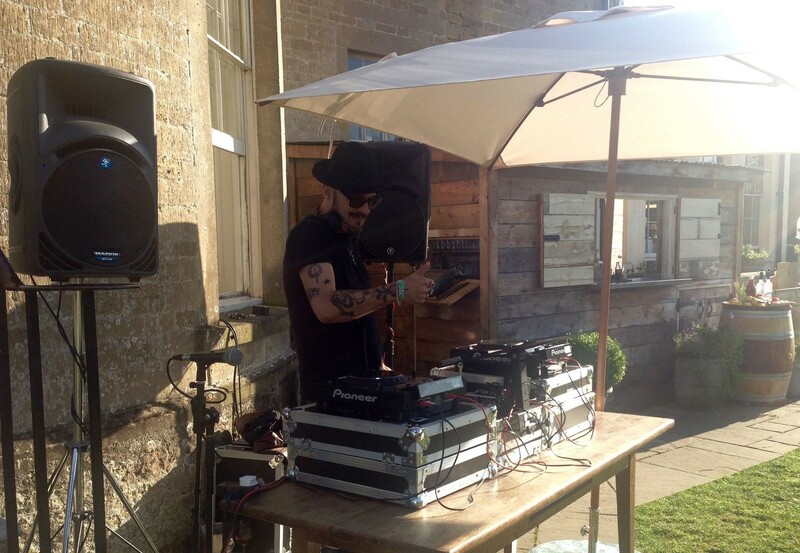 Hire DJ equipment and kit from STYLISH Entertainment including CDJs, 1210's, DJM, PA's, Microphones, Deck-stands. Some of your family are not natural public speakers so we offer a sound-reinforcement system that is easy to use and discrete. We will install and collect from the venue. We normally supply a radio microphone which does not need wires. Also, the system can have an Ipod / MP3 connected for back-ground music during your wedding breakfast and drinks if required. 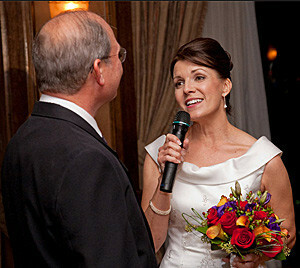 We can hire you a small PA and radio microphone for speeches. If the best man says he needs a projector and screen for his "presentation" first of all panic and then make contact with us. Projectors and screens are also used for displaying a brides and grooms adventures with each other - bungee jumping in Budleigh Sauterton as an example! 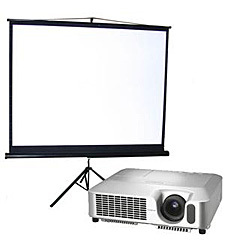 We can also supply a laptop and DVD player to connect to the projector. Hire a projector & screen or plasma TVs for presentation and speeches. High tables for standing around and putting drinks on. Great for giving shape to a dance-floor or meeting space. We have a couple of options available, LED Poseur tables which light up and compliment our LED furniture. We also offer some lovely original wooden tables, deep crimson in colour with gold fretwork in the middle and blue LED lights inside which makes the middle glow. We can deliver to your venue, set-up and collect or, you can dry hire from us. Poseur tables are great for conversing and placing drinks. Contact us if you have any hire requirements however obscure, we can only say "No - we can't help you out" usually, we say "Yes, how many do you want!"